This afternoon I put my daughter on a plane to sleep away camp. It was the first time she has flown by herself. Two months ago when we made the plane reservations, it sounded like a cost-effective way to get her there. She would read a book and two hours later be there. She was fine with it. Sensing a bit of anxiety in her this morning, we intentionally laughed our way through the airport. After pizza and ice cream, they called her to pre-board. They told me to say my goodbyes because I was not allowed on the boardwalk. In an instant my heart sank. It felt as if they were taking her through the double doors into surgery. I did the worst thing a parent could do in that situation. My eyes filled with tears, drawing instant insecurity across her face. I watched as they shuffled her down the boardwalk until she turned the corner. I could no longer see her long blond hair. I uncharacteristically freaked. would just like to lock eyes with the person I have entrusted my daughter to, a gesture I hoped would evoke an element of accountability for my 11-year-old. The ticket clerks launched into a lengthy protocol of airline policy regarding unaccompanied minors. There it is. My love for Lily demanded more than just standard protocol for her life. I wanted a higher standard over her…to protect her, comfort her, and keep her from harm. Isn’t that how God feels about us? We’re not just another person. We are HIS children. He wants more for us. He wants to protect us, comfort us, and keep us from harm. Then I remember our conversation after finding a great parking spot right by the airport elevator. I said in my delight, “Yay! God’s hand is all over us today”. She replied, “Totally Mom. He’s massaging us with His goodness.” With that I remembered, she was going to be just fine. 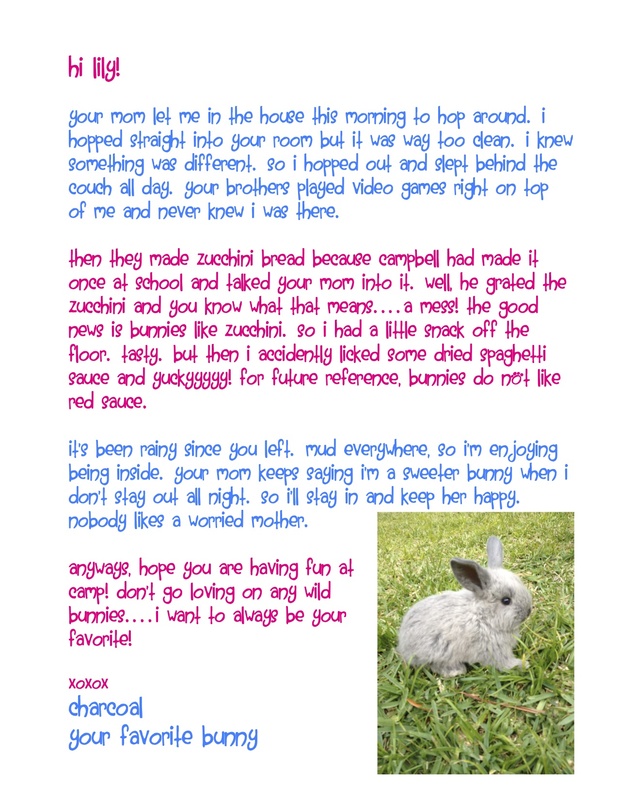 A LETTER FROM YOUR PET-The big worry in sending a letter to camp is not wanting to make them miss home. Last year our letters were all sent from our hamster, Pumpkin Muffin. We gave my daughter an update but it was from his perspective. She loved it and read the letters to the girls in her barn. This year her bunny is writing them. A BOX FILLED WITH WIGS, TUTUS, and one of these CRAZY HATS- Camps usually have several costume parties and everybody loves a ridiculous wig or pair of crazy glasses. NFL Playing Cards – Does your child have a favorite sports team? Order playing cards with that team. Crazy Creek Chair – This is the ultimate cool chair at camp. From sitting around the camp fire to the gatherings at night, this chair goes everywhere. BOOKS BOOKS BOOKS -Here is a book list for middle schoolers. For younger kids here are cute books all about camp.Click image for full list. BOOK LIGHT – Every reader needs a light for quiet time especially in a room with a dozen other kids. PRE WRAP!! !- my daughter’s favorite!! We make headbands, bracelets, and all sorts of fun creations with this gauzey, lightweight material.Our camp doesn’t allow duck tape for obvious reasons, but pre wrap is fabulous! Insanely Cool Spheres – These balls start out small but expand in 2 seconds to enormous spheres. The glow-in-the-dark factor even makes them cooler. We learned about these at the Science Center. STATIONERY –pre-addressed and stamped envelopes with colored pencils and stickers…but do something funny on the paper. Start the letter for them in a humorous way like, “Dear Mom and Dad, I haven’t brushed my teeth or taken a shower since I got here” or something your child would find funny. COLORED ZINC – Worry about them not wearing sunscreen? Throw in some colored zinc and they are sure to decorate their faces in all sorts of ridiculous fashion. TEMPORARY HAND TATTOOS – great to share with lots of kids too. Can’t you imagine a cabin of boys and a “Shark Attack” with these? SOUVENIR TO DECORATE– a pillow case, white towel, or plain white t-shirt with fabric markers so everybody can sign. You could even send a t-shirt for each child in the cabin. I’d love for you to follow The House of Hendrix below and if you have not already, Like us on Facebook. This entry was posted in kids, NrelateShare and tagged camp, fun, Kids, lists. Bookmark the permalink. That is great, Alli! I will be packing Elizabeth up for the very same thing…plan & 2 weeks away. Thanks for the tips and reminder that I know she is good to go! Found this through Pinterest – great ideas!! Every year at camp one of my friends would get an enormous box of Jelly Belly jelly beans that she would share with the whole cabin. It made her super popular and was something we always looked forward to. Cut it out! This list is fantastic! You’ve inspired a care package for my old camp buddy! If your son plays the card game Magic, Ebay sells “culled” decks that are of super high quality/utility in the game, for not so much money. My son loved them last year. What a great idea! Who doesn’t love a mustache? Thanks for sharing. Do you have instructions for various things you can make with Pre-WRap? I can only find you-tube videos which I can’t send to camp in a care package. My son is 22 but travels across the country working on pipelines. He would still love a letter from our cats that we have had since he was 10. Great ideas. Haha, your cats should definitely write him and bring a smile to a 22 year olds face. I’m not a parent, but a summer camp counselor at camps with 1 week sessions. I’ve been perusing pinterest for ideas and fun! One of my favorite things is when pets send letters or postcards! The kids (my experience is with elementary school kids) LOVE it! They read that letter to everyone and it brings such big smiles to their faces. It’s as cheap as the paper and stamp to get it there! Heck, it’s basically free if you send it in an envelope with a letter from you! They also love getting letters or pictures from siblings, even the ones so young that all they do is scribble. Any time you can make something they don’t like doing but have to do (teeth brushing…) fun, is great! Just be aware of what is allowed and what is typical at your camp. I’m not saying to do only what others do, but if it’s rare that kids at the camp get any packages don’t send a daily package with lots of toys and candy, especially without anything to share. Also, be aware of food rules, especially with allergies as prevalent as they are. If food isn’t allowed and you sneak in some candy that has nuts in it and your kid hides it and potentially shares it or doesn’t wash their hands before touching other things kids can have severe allergic reactions especially if they don’t know the kid has allergies. I’m really excited that this article focused on non-food items and included a few easy/cheap/free and items to share! Of course I’m not at all saying that you can’t send things just for your kid but just ask the directors what is typical and what is allowed. I also like notebooks and pens, cards or little games the kids can play together if your kid wants to. 🙂 Love this post! What great insight Kim! Thank you. Yes, our camp doesn’t allow candy or food items so we avoid those completely. I love your input from the other side. Thanks!!! Just sent our granddaughter off to resident horse camp today. I’m shopping for some of these items and sending them via the quickest way possible! Thanks for such fun ideas! BTW, it was a tradition in our home that, as soon as each turned 5 years old, each of our 2 boys took his first solo plane ride from our home in Seattle to see Grandma and Papa in southern California. They were so proud of themselves! They are now 28 and 34 and speak fondly of their “independence”. Enjoy your summer! I love hearing that solo flying grew your sons independence. I think kids so desperately desire to be given opportunities to be independent, but I struggle with knowing exactly what those limits should be. Thanks for commenting Lu. I sent my daughter a flip flop at camp (unwrapped). I just wrote the name and address with sharpie right on the flip flop! I gave her the matching one later when I went to get her. There are lots of other ideas of things you can send without wrapping, as long as they are under 13 ounces! Have fun! Such a cute idea! We love doing the 13.1 ounce unwrapped send. Our favorite is a ball. sendaball.com is a fun unique gift. Your post was EXACTLY what I needed! My 11 year old is off to camp again this summer and I kinda missed the mark on fun stuff last year. I can’t wait to “borrow” your ideas! The pet one is FABULOUS!!! She would giggle at “pumpkin muffin”! Great ideas, my 9 yr old is going for the first time this year. I made her a quick quilt with two twin bed sheets. I’m going to send her with some Sharpies for her cabin mates to sign at the end. I had made a white one for myself when I was away at college as a RA, I had each resident sign it before I would release them from their room. Now 23 years later I have a written memory of my college years. I figure she can keep taking it back year after year for memories that will last forever. Lara, what a great idea! I’ll have to remember that! I want to recommend a Flipside pillowcase! It’s a super soft fabric with colorful and inspirational messages on one side and the other side is cotton with a non toxic marker for autographs. We started with messages from home then mailed it for their friends to finish. It fits a standard pillowcase so it practical! They love it!